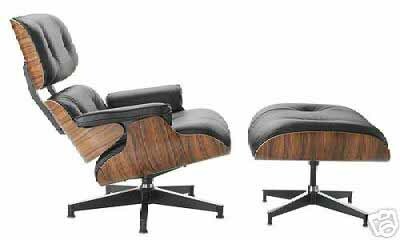 Herman Miller Eames Lounge Chair and Ottoman - New Leather with Santos Palisander, Natural Cherry, Walnut and Cherry molded wood frame. BLACK LEATHER CHAIRS IN STOCK FOR IMMEDIATE SHIPPING - NO WAITING! 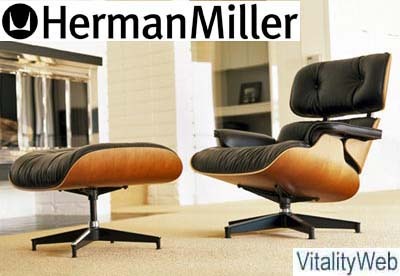 Herman Miller Eames Lounge Chair and Ottoman - Celebrating its 51th anniversary in 2007, the Eames lounge chair and ottoman are considered among the most significant and collectible furniture designs of the 20th century. The rich veneer and supple leather suggest old-fashioned luxury translated into modern forms, setting an enduring standard for comfort and elegance. In addition, the lounge chair and ottoman are now available in a veneer called Santos Palisander that captures the original's unique look. The Original Look Classic aesthetic - The lounge chair and ottoman are available in santos palisander, a lustrous veneer that has the same characteristics as the original Brazilian Rosewood color and grain. Environmentally sound. The wood is harvested exclusively from sustainably managed forests. Classic Comfort - Luxurious feel. The chair has 6-inch-thick urethane foam cushions and rich leather upholstery. A place to relax. The contours of the seat and high back welcome the sitter, and a swivel mechanism is built in. Quality and Craftsmanship - Attention to detail. All pieces are hand assembled. Durable construction. Like all classics, the chair and ottoman just get better with age. Both are hand-assembled with great attention paid to the details. Shells are 7-ply cherry, natural cherry, walnut, or santos palisander, a richly grained veneer that looks like the Brazilian rosewood used on the original chair but is a sustainable tropical wood; the base and back braces are die-cast aluminum. Practical features. Cushions are individually upholstered and replaceable; back cushions are interchangeable; shock mounts are resilient natural rubber. Design Story - The Eames lounge chair and ottoman is the culmination of Charles and Ray Eames' efforts to create comfortable and handsome lounge seating by using production techniques that combine technology and handcraftsmanship. Its heritage goes back to the molded plywood chairs pioneered by the Eameses in the 1940s, and it's part of the permanent collection of New York's Museum of Modern Art. Charles Eames said his goal for the chair was the "warm, receptive look of a well-used first baseman's mitt." Every one is a special refuge from the strains of modern living. The first lounge chair and ottoman, produced in 1956, was a birthday gift for friend Billy Wilder, the Academy Award-winning film director, and it made its public debut on Arlene Francis' Home show, which later became the Today show. Every lounge chair and ottoman manufactured since then has received the same meticulous handcrafted attention. Available Colors and Fabrics. BRAND NEW - SEALED IN A 36x36x40" BOX - GROUND SHIPPING AND SALES TAX INCLUDED!! 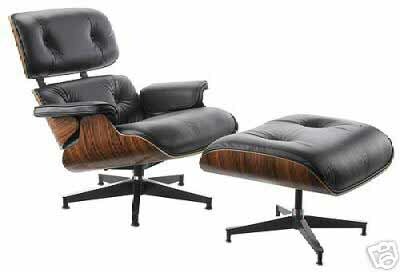 AUTHORIZED DEALER for the EAMES LOUNGE CHAIR AND OTTOMAN with FULL FACTORY WARRANTY!! We stock the Black Leather in all four color woods for immediate shipping. PICKUP AT OUR SAN DIEGO SHOWROOM! !